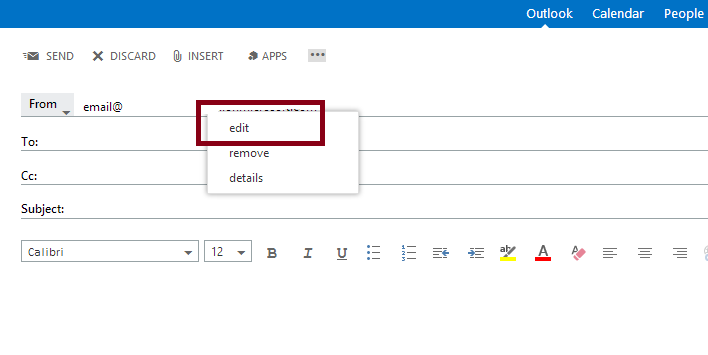 It may not be immediately obvious how to get to the ‘From’ field in Office 365 webmail so you can send as another account or distribution group you have access to, but here’s how to do it. Open a new email and, if it’s not there already, add the From field by clicking the three little dots and selecting ‘Show From’. Right-click on the from email address and select the edit option. Type the new address or select it from the address book. You’ll now see your available list of sender addresses in the drop down list every time you send a new email. If you make a mistake in a new address or just want to remove one, simply select it, then right click and select “Remove”. Everything is happened as your step-by-step explanation. But, the receiver is still seeing my primary email address as the sender. Anything I missed? Thank you. Are you sending from a distribution group or another account? If it’s another account, check that you have ‘send as’ and not ‘send on behalf’ permissions to their mailbox. If you have both, remove the ‘send on behalf’. Jumping in… Sorry Piers, same with me. There is no Send as or Send on Behalf option. So now I have my business domain on my drop down list, but my recipients still see my Hotmail address – even though when I send it out its shows my business domain. Any thing I am overlooking to get the MS to not scrub it back to their domain? Do you have an Exchange account or just Microsoft account? If it’s a Microsoft account you will only be able to send from the Hotmail address. Is there a way to keep the setting, e.g. if I always want to use the distribution list’s address as “From”? Right now I’d need to do this for each mail I send. Not that I know of. It would be better to switch your primary email address to that of the distribution group if you primarily send from that one. That’s for the how to. I’m struggling to figure out how to remove an address that had a typo. When I click remove it doesn’t remove it for good and now there is 3 from options when I only want 2. I have updated the post with how to remove an address. If this is how you’re doing it and it’s not working for you then let me know and I’ll see what I can do to help. Just wanted to say thanks. We’ve got folks already set up with Full Access permissions to a shared mailbox and these instructions worked perfectly to allow them to send from the shared mailbox address in OWA. Good stuff! I connected my work exchange account to OWA that has my another exchange account as the primary address. Even the work exchange emails I send show as sent by my primary on behalf of the work. How may I set up so that when I send from my work email there is ‘on behalf’? 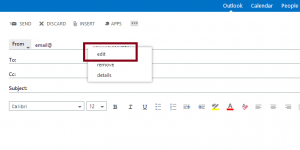 The “send as” or “on behalf” is set by the permissions granted to the account. What version of Exchange are you using?